Here we are going to introduce iris diagnostics and iris therapy. 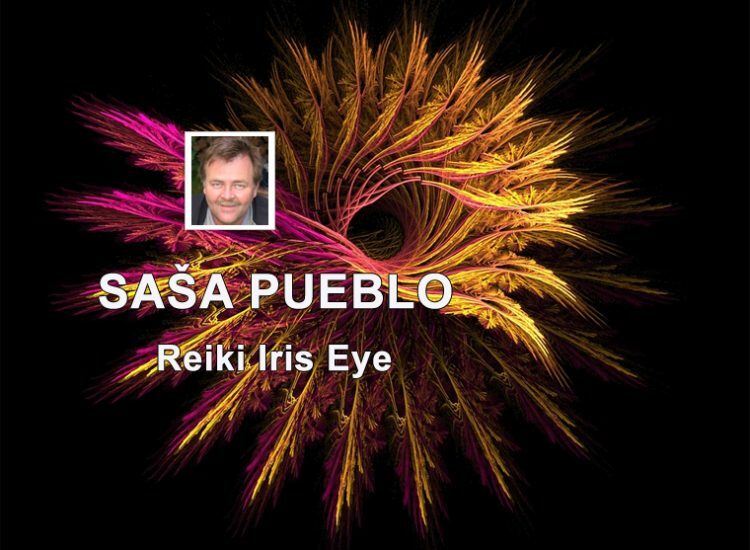 It isn´t ordinary to link Reiki and iris diagnostic through Reiki healing. And so we started to collect experiences from distant Reiki healing. Firstly we should take this material as the basis to orientate in iris diagnostic topic. We will gradually practice iris treatments via Reiki. By oracular techniques on distance we already know micro damages in the eye and subsequently uncover these damages in the brain and in the body. We treat individual damages by automatic drawing. Or by certain kind of micro motion. Alternatively by Reiki symbols. We prepare to share our research and results in iris diagnostics. The sensory system consists of five basic senses: sight, touch, smell, hearing, and taste. It is the basis of concentration into inner world of the esotericist. Both in physical parts, but also to memories. The sight is physical sense, allowing the view of light, color, body shape and orientation in the space. Human eye has the ability of colorful vision. The visual organ consists of its own eye and the side eye. The human eye can bring concentration into inner world of human. Visual system is the set of organs which ensure reception, transmission and processing information. Information is transmitted by the light stimulus to complex of nerves irritations and the result of this is visual perception. Visual system can be physically trained. Both for healthy eyes and for extraordinary abilities. Iridology is one of segments of alternative medicine which deals with diagnosis of a person´s health conditions according to the image of his eye iris. Iridologists say that each part of iris shows condition of certain part of the human body, organ or system. Iris is the organ in the eye. Together with lentils divide forward and back chamber. In the center of the iris is central gap called pupil (pupilla). The main function of the iris is the border of front and back segments of eyes. Eye cataract is a disease of lens where lens loses its transparency and starts to become cloudy (most often because of degeneration). Glaucoma is eye disease. A major feature of the disease is increase in intraocular pressure and all other symptoms of this disease result from it. Complete blindness is permanent and complete loss of vision when ill person can not even perceive the light. Practical blindness refers to a significant reduction in visual function. Blind spot is certain part of human field of vision which is projected into the area of optic nerve target. Color Blindness is a disorder of color vision of human eye. Its professional name Daltonism is derived from the name of English physicist John Dalton. Instruments for Iris diagnostic I. Web pages where you find information about instruments for iris diagnostic. Iris diagnostic uses different technical tools to diagnose whole body through the eye. And we also have computer software to evaluate received photos. Instruments for Iris diagnostic II. Instruments for Iris diagnostic III. Instruments for Iris diagnostic IV. Iris diagnostic may become the base for human health examination through the computer and this will be done in home comfort. Program processes our shot from eyes and examines what is ill and should be treated. Of course it is song of future. Eye movement tracking for neuroscience diagnosis. When examining with EEG, a cap with electrodes is placed on the head through which the device communicates with the brain. The examination itself is not painful but severe headache may occur after examination. This device – your computer can replace or transfer nerve commands from the brain to the body, often also into artificial replacements such as limbs and similar. List of pages about iris diagnostic, contains articles about iridology, iris diagnostic – iris diagnostic, online training of alternative medicine – iridology, book about Iridology from the author Colton James. Here you find information what is iridology. It is sector of alternative medicine which deals with the diagnosis of the human health condition according to eye iris. Perforated glasses provide the training of eye muscles that we can do in everyday activities. But perforated glasses are also a tool to improve the movement of concentration over the brain. Retrieving memories with your eyes and fingers. And someone can learn to recall memories even through the movement of fingers on hands. Memories recalling can also be done through the skin surface. In anatomy, crystalline is water-soluble structural protein found in lens and the cornea of the eye. Crystaline may have several metabolic and regulatory functions, both inside the lens and in other parts of the body. Third eye – is prehistoric structure, India and the worship of a man with a monkey head, the chakra associated with it, beware of dwarfed eye nerves on the forehead between eyes – and this is important. Basically, this has be taken that dormant stem cells are hidden in present brain of the man from different stages of development in our prehistory. We assume that by concentrated meditations could be activated around 10 prehistoric brains within classical human brain. We have done oracular performance in this direction. We have medical evidence of close eye and brain connection. They originated from original foundation of child’s development. By clairvoyance techniques we compared the state of the body and the state of the brain and the micro-state of eyes. And eyes always showed damage of the brain and the body with minor damage of the eye. The optic nerve is pair of head nerve that transferes vision from eye retina to vision centers. Into eye bucket comes through blind spot. In addition to classical nerves, we also have special visual nerves in the forehead and forehead arches around eyes. The front end about 4 to 6 eye nerves. And the eye nerve has a connection to nerves of the face. It´ s triple nerve. So our vision is bit more complicated than we can imagine. This is also about third eye issue. It can have different meaning. Here we have unique treatment. We can practice it remotely using distant Reiki. Reiki system connects 5 people who have been treated through iris eye system. Or you connect 5 individuals who diagnose and treat iris eye system. You engage these people to 10 people and from a distance you send energies into eyes of person being treated and then to the brain and together into the body. For long-distance treatment, you need a lot of interventions and not just one. And so you can also treat yourself by self-healing. Get a picture of your eye from iris specialist. Damage in the eye gives the potential for extraordinary deep meditation and healing concentration in parts and systems and organs of the body. It is classical concentration inside through eyes. There is also concentration with rhythmic strokes. We call it a trance. The automatic drawing will help us calm down, keep us from constant worries and stress so that it cleanses negative emotions, negative energies from our psyche and also develops and strengthens our intuition. The hand is the end portion of the upper limb of the human. The hand consists of a wrist and five fingers. A finger is one of the five movable units ending palm of hand, e.g. index finger, ring finger. Lips are visible organ around the mouth. In most cases, the upper lip is smaller. Lips express emotions. You draw through a point in the center of the eyebrow. Forehead is indication of the face of humans, mammals and other animals lying up from eyes. From the point of view of the human skull, forehead forms part of the frontal bone. Skin is an organ that covers the human body. The skin area of an adult human is 1.6 to 1.8 square meters, making it the largest organ of the human body. It has many different functions – protective, thermoregulatory, sensory and immune. Meridians are energy paths, there are 12 major pair meridians and 2 meriands unpaired in the human body. In addition, there are eight special meridians. Meridians have an impact both on physical and psychological condition. Tail bone is made up of three, four or five rudimentary vertebrates. In each of the first three segments, the elementary body and the hinged and transverse projections can be traced. The muscle is a clearly defined muscle tissue. It is a movement organ of animals, including humans. The head is the front part of the body of animals, mostly motionally detached from rest of the body, the center of sensory organs, the digestive system and the breathing system begin in the head. The imagination is psychic content, a meaningful entity that in my mind acts as the object of my thinking, feeling, desire, my imaginative activity, or as a dream, as the first object or process of the outside world after the objective presence of the present. Under pendulum we will understand smaller weights hanging on the weft and on the bottom often with metal or crystal. Rarely there can be a meteorite piece. We hold the string between the index finger and the thumb. Using a pendulum over the image of a human organ, you draw lots of lines. Other drawings over healthy organs and other drawings over sick organs. And with the pendulum, treat diseased organ until the drawing resembles a drawing above the healthy organ. And so you treat it in the eye, in the brain and in the body. Katarina Horakova: What can be read from eyes?